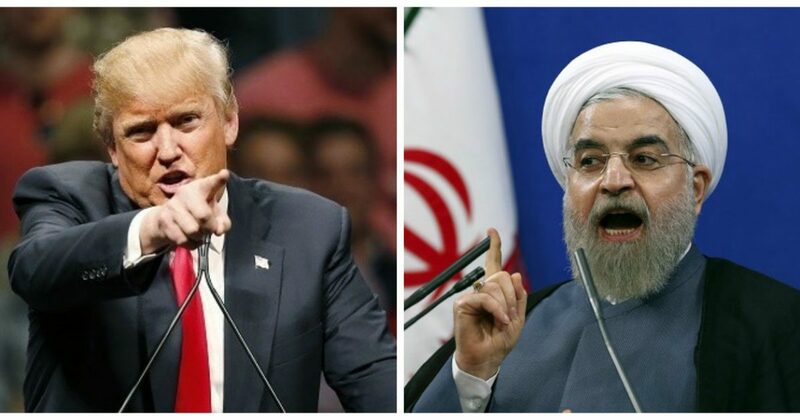 Keeping another campaign promise, President Trump has pulled the United States out of the steaming pile of Barack Hussein we know as the Iran nuclear deal. Allow full IAEA (International Atomic Energy Agency) inspections of its facilities, cease all nuclear weapons development, and dismantle its existing nuclear weapons development program, proof of which was recently confirmed and documented by Israeli intelligence sources. Die by economic isolation and strangulation or by invasion by US and coalition forces. The mullahs can crow all they like about their proud Republican Guard. Like Saddam’s most elite forces in the great “Mother of All Roadkills,” the Republican Guard will be surrendering to battlefield journalists and cameramen. Barack Hussein damaged American and global security to the point that now drastic measures must be taken or the international community must be prepared in the next year or two to Iran nuking Israel and possibly Saudi Arabia. They have promised to do it and they will. It is one of the few promises from the Iranian leadership that you can count on. Let it die. May the Iranian people rise up and take back their country. They now have a friend in the United States who will not sit back and watch as did Barack Hussein while the mullahs slaughter their defenseless opposition. From a 2015 Powdered Wig article speculating on what we might expect from a Trump presidency (Trump had just announced his platform which I was elated to hear)…. Trump will be forced to deal with this issue quickly, as every day is another day closer the nutjobs in Iran are to building a nuke, annihilating Israel, and pointing their ICBMs toward Europe and the US. “Good morning, your Ayatollahness. Any deal you had with Barack Hussein is dead! You will receive no money from us. NONE! All sanctions are back in place, plus some new and creative ones my team of certified geniuses has come up with. I’m sure you will enjoy them. As of right now (The Donald checks his watch) you have 24 hours to dismantle your nuclear program. Our inspectors will arrive tomorrow morning to inspect every square inch of your facilities to ensure compliance. Nothing! We will just get out of Israel’s way. They can handle this. They are fueling their jets right now. Of course, we will be backing them with air refueling, satellite and air reconnaissance, etc, as any good ally would do. Our armed forces are also on alert in the event the Israelis need help, which is very unlikely, but who knows, they may get tired of bombing you into next week and ask us to give them a break. President Trump said Tuesday he would walk away from the Iran nuclear agreement, a decision he took after concluding that the deal has only emboldened Iran and prevents the U.S. from keeping Iran from developing a nuclear weapon. “I am announcing today that the United States will withdraw from the Iran nuclear deal,” Trump said in a White House press conference. The Treasury Department explained that some sanctions would be reimposed in 90 days, while others would be reimposed in 180 days, but did not provide a further explanation of which sanctions would take hold when. Tuesday’s announcement came a little more than six months after the president informed Congress he would not recertify the agreement, which he had long hammered as an insufficient insurance policy against Iran’s weapons development program. Trump’s biggest grievance with the Obama-era deal has always been its so-called “sunset clause,” a provision that allows key limitations on Iran’s use and development of new technologies for uranium enrichment to be phased out beginning in 2025. He said leaving the “horrible, one-sided deal” in place would have led to a dangerous nuclear arms race in the Middle East. Israeli officials in particular had urged Trump to scrap the deal in the weeks leading up to his announcement, arguing that the current structure forces the U.S. and its allies to prepare for a day when Iran has nuclear weapons because of the agreement’s expiring constraints, according to a national security source close to the White House. U.S. officials began working closely with their European counterparts in January to make improvements to the nuclear deal, known as the Joint Comprehensive Plan of Action, so Trump might be less inclined to withdraw from it entirely. But Secretary of State Mike Pompeo reportedly informed France, Germany, and the United Kingdom late last week that the president was dissatisfied with the proposed changes and planned to take unilateral action. German Chancellor Angela Merkel and French President Emmanuel Macron both urged Trump to preserve the deal during separate visits to Washington shortly before the May 12 deadline to reinstate sanctions against the Iranian regime or renew the current waiver. Trump spoke with Macron by phone on Tuesday morning, hours before delivering his televised address from the White House. The French president had warned reporters over the weekend that a decision by Trump to withdraw from the agreement “could mean war” between Iran and the West, something Iran also alluded to. “If the United States leaves the nuclear agreement, you will soon see that they will regret it like never before in history,” Iranian President Hassan Rouhani said during a speech on Sunday. Russian officials also warned the U.S. ahead of Trump’s decision that exiting the agreement could have “harmful consequences” for the international community. Top White House advisers and Cabinet-level officials spent months preparing Trump for Tuesday’s announcement, and internal deliberations sometimes spilled into public view. When Defense Secretary Jim Mattis said in congressional testimony last fall that preserving the agreement was in America’s national security interest, proponents of the nuclear deal seized on his comments. But when Trump tapped CIA Director Mike Pompeo, a strident critic of the agreement, to be secretary of state, upholding the agreement seemed like less of a guarantee. Newly-appointed White House national security adviser John Bolton had also criticized the deal prior to joining the West Wing, once describing it as a “strategic debacle” on Fox News and arguing that it be destroyed and replaced with new sanctions against Iran. Trump’s decision to scrap the deal and reinstate sanctions on Tehran is likely to inject tension into the U.S. relations with European allies, though administration officials expect the backlash to blow over rather quickly. European leaders were expected to meet Tuesday afternoon to discuss a path forward for the agreement and the economic and political consequences of Trump’s withdrawal from it. Merkel, Macron, and British Prime Minister Theresa May have previously said they intend to stay in the deal, along with Russia and China, in order to prevent it from collapsing. Pompeo reportedly told the E3 countries earlier Tuesday that the Trump administration would be open to resuming negotiations if its European partners agree to be more aggressive in eliminating the deal’s so-called sunset clauses.